First, the more realistic the costume looks, the more I like it. If I get a feeling the character being portrayed might actually exist, then that’s a success. To give you an example, I never really liked the Batman movies until I saw Batman Begins. To me, that’s when the character really became respectable and interesting to watch. Second, the more specific the reference, the less people will recognize it – but the more value it has to those that do. Sure, people might appreciate how cool a costume looks, but will they understand very subtle references? In my mind, I see subtle references as a gamble – those that understand it will have a greater payoff. To start us off, I have a costume that is completely original – I asked the guy to be sure. I’m not certain what compelled him to dress up like a horse, but I can nonetheless appreciate the creativity that went into the costume. Not to mention, the effort it likely took to make it look that good. Most people can identify a Darth Vader costume with ease, even if they haven’t seen the Star Wars saga. I, for example, have only recently gotten around to watching the first Star Wars movie, A New Hope. Shocking? Yes, people tend to react like that. Yet, I have known about Vader for a very, very long time. Despite my current appreciation for the Star Wars universe, I can’t help but be slightly disappointed by seeing exactly how common the related costumes are. Considering the above, I was pleasantly surprised when I spotted a unique variation of a Vader costume. 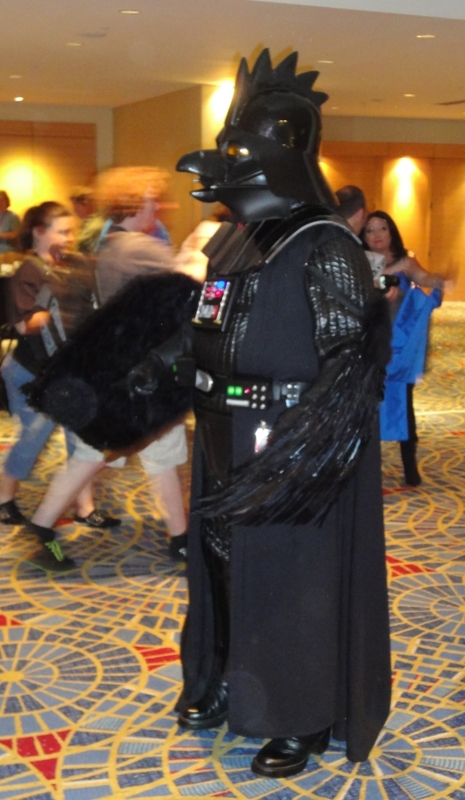 For some reason, this guy decided to modify a Darth Vader suit, and made him look like a dark, evil rooster. I really found that funny, and knew he would be in my Top 10 for putting a lot of work into that comedic twist. Though I don’t know much about the Harry Potter universe, I had to include this costume in my list. According to the google searches I ran, it seems she’s portraying a character known as Fawkes the Phoenix. Despite my lack of knowledge, I found that the costume had a great combination of vibrant colors, and a clever design. 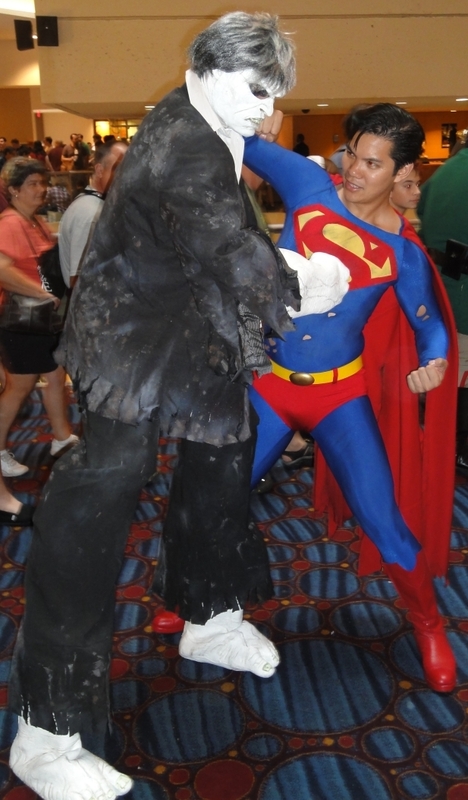 Some costumes are so common at conventions that you can grow tired of seeing them. 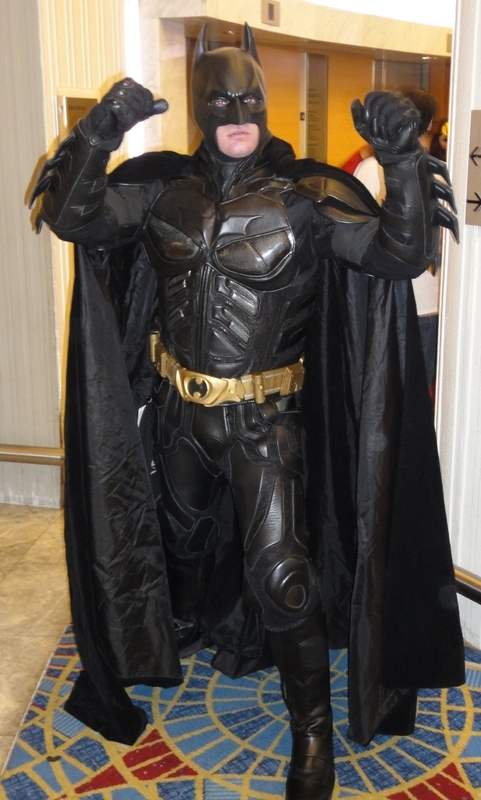 Batman seems to be a popular choice, so I have a tendency to only take pictures of the best ones I encounter. 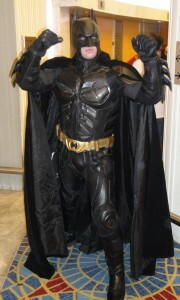 One particular Batman costume really stood out, and was so high in quality that I felt he could potentially be real. The design reminds me of Batman Begins – granted, it’s more cloth-based than the one in the movies, but still struck me as being particularly realistic. That’s right, folks – a Zach Galifianakis look-a-like. Galifianakis gained a huge amount of popularity from playing Alan in the films The Hangover, and The Hangover Part II. 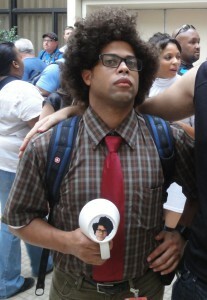 At Dragon*Con 2010, I saw an imitation of him, and listed him as a runner-up for my Top 5 Costumes list. It wasn’t just about his costume, I also enjoyed a comment he made after I took a picture of him. This year’s Alan didn’t make a comment, but seemed a better fit for the character. As I’m saying it, I realize that might not be a compliment, given as the character being portrayed looks like a fat, possibly homeless man. The humour behind his character also lies in the fact that he has a very strange behaviour, so that’s not very positive either. In any case, this year’s Alan seemed to be the best natural fit for the character, and jokes aside, I think he did a good job with his behaviour and costume as well. I’ve been to Dragon*Con for two years in a row now, and there were only two moments where I had to question whether I was actually looking at a celebrity, rather than a person in a costume. Last year, it was a Zach Galifianakis look-a-like. 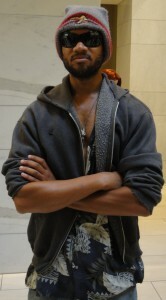 This year, I thought I saw Will Smith… as John Hancock, from the movie Hancock. While I never actually saw the movie, I remembered seeing plenty of pictures of Will Smith’s character – so when I saw this guy in his costume, I was really impressed. When I originally spotted this guy, I didn’t know what character he was dressed up as. He looked like a white version of Hulk, though less muscular, and quite tall. So tall, in fact, that it gave him a towering presence – it lead me to question whether it was natural, or he was wearing platform shoes. Either way, it certainly made the character feel realistic, and possibly a threat. I stayed a few minutes, observed his behaviour, and realized that he had a tendency to attack men, and yet, was extremely friendly towards women. I’m not sure if he kept that up all the time, it could have been just a coincidence – but I really enjoyed seeing this unique behaviour. Upon reading this, I also realized that I even had a picture of him fighting with Superman. It was probably a coincidence, mind you, but a great one at that. Credit: Ruby Rinekso as Solomon Grundy. As I was taking a break from taking pictures, a girl dressed as a squirrel wandered into my general vicinity. I was particularly amused when I noticed that there were also plush squirrels attached to her belt. She was accompanied by what appeared to be a guy in a regular Doctor Doom costume. When I approached, I realized that this particular Doctor Doom was actually covered in squirrels, as if they had been attacking him. I enjoyed the humor behind the costumes, but wondered whether it was an original idea, or a reference to something. Surprisingly, when I asked, they mentioned that Squirrel Girl was an existing super hero in the Marvel universe. Not only that, they were depicting a very specific scene from her comic books, one where she manages to defeat Doctor Doom with the help of her squirrel minions. They even pointed out that there was a picture of the scene on Squirrel Girl’s Wikipedia page. I always appreciate specific references, and this was a great example of one. Not only that, but even if you didn’t know who Squirrel Girl was, the combination of costumes was excellent – both very well made, and amusing. Credit: Andy Floyd as Doctor Doom, and Becky Montgomery as Squirrel Girl. The only downside, of course, is that I must now live in fear of squirrels – I never realized they had such destructive potential. 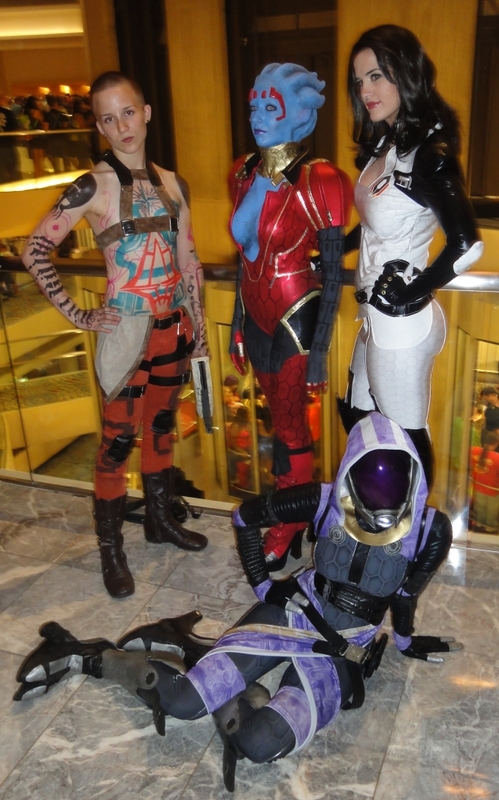 I am a huge fan of the Mass Effect series, and was thrilled to see a group of women dressed up as characters from the game. 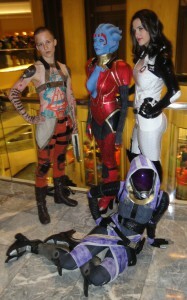 Specifically, the characters portrayed were Jack, Samara, Miranda Lawson, and Tali’Zorah nar Rayya. The costumes themselves were very impressive when it came to quality, and accuracy. I can only imagine the work that went into creating some of those costumes – particularly for Samara and Tali. While the Jack and Miranda costumes may seem like they might have been easier to make, I must mention that the women were doing a great job at reflecting the character’s personalities. Together, they made for one amazing photo opportunity – I really appreciated that. Set in the London offices of the fictional corporation Reynholm Industries, the show revolves around the three staff members of its IT department, comprising two geeky technicians, a genius named Maurice Moss and the workshy Roy Trenneman, headed by Jen Barber, the department’s ‘Relationship Manager’ who knows nothing about IT. The show also focuses on the bosses of Reynholm Industries: Denholm Reynholm and his son Douglas. Given that it is a British show, and that few people I now have seen it, I never thought I’d see a reference to it at Dragon*Con. Yet, there I was sitting outside one of the hotels with my sister, when Maurice Moss walked by. Not the real Moss, of course, but he was an extremely good imitation, on multiple fronts. Before I dive into the details, I suggest checking Google Images to see what the character normally looks like. Credit: Lucien Freeman as Maurice Moss. He was dressed pretty much exactly like the character. His hair was parted just like the real character, though it may have been on the wrong side of his head. He spoke just like character, and though I believe it was a fake accent, I couldn’t figure out for sure – and that’s great. He was holding a cup that had a picture of the actual Moss character pasted underneath it. Points 1 to 3 were all contributing factors towards my choosing him as the best costume. However, it was really #4 that sealed the deal – it is a very specific reference to a particular episode in the series. In the episode, Moss claims to have acquired a cup that features his face underneath it, all to ensure he can tell it apart from the others. To better showcase the humor behind the cup, I’ve found a YouTube clip where Moss first introduces it. It appears at the 45 second mark, and while it does get some attention in the clip, there are numerous other references in the episode that make for quite a funny episode. That concludes my Top 10 costumes for Dragon*Con 2011. If you’re mentioned in my post, and would like me to credit you by name, please feel free to e-mail me at mref…@gmail.com. You can also post a comment below, I always enjoy hearing from Dragon*Con attendees and cosplayers.